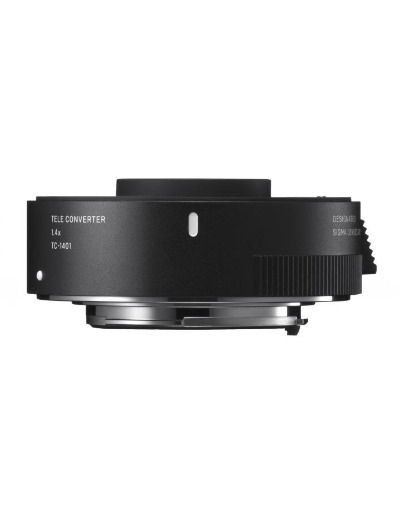 The SIGMA TELE CONVERTER is developed exclusively for the new lens lines. By mounting it in between a telephoto lens and a camera, the offered magnification of focal length of TC-1401 is 1.4 times times respectively. TC-1401 incorporates SLD (Special Low Dispersion) glass elements that offer excellent aberration correction. It is exceptional for a lens accessory to use one of the best glass materials, yet this is because SIGMA is seeking for the best image quality, and it is necessary to meet the new "SGV" standards. TC-1401 incorporates 1 SLD (Special Low Dispersion) glass element. By minimizing chromatic aberration effectively, it has achieved very good optical performance, thus it is possible to maintain the optical quality of the original lens. Dimensions (Diameter×Length) Φ69.8mm×25.0mm / 2.7in.×1.0in.